So, we did it we went to the BIG ultrasound appointment. 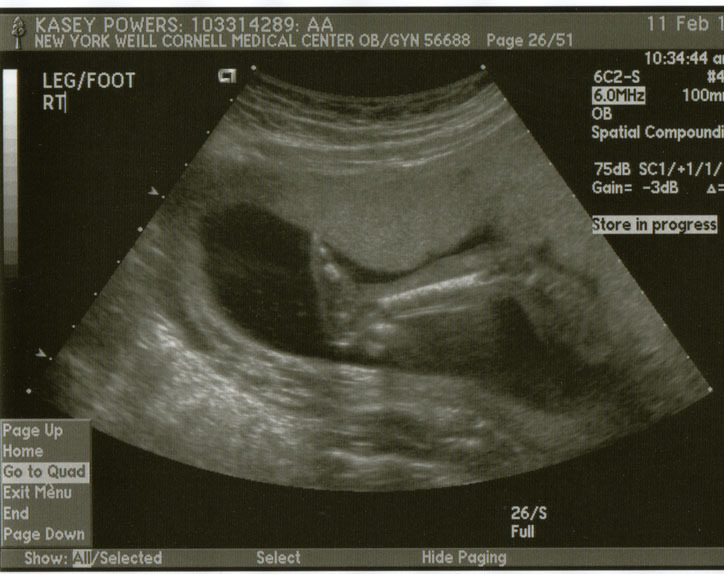 And babykakes was decidedly stubborn. We got the gender, and it’s a BOY! But that was the easy part. We got the major organs. The heart beat was good, that was a tricky one, he wouldn’t cooperate. He was moving around some at the beginning of the appointment. And then must have gone to sleep, because he would. not. move. So we didn’t get the cute profile shot. We did get to see his 10 fingers and 10 toes. We left with instructions to come back in a week and drink lots of juice before the appointment instead of water. And to bring chocolate just in case. We went home, and named him. We are having a boy. I’m having a SON. I am still in awe over it. We called and told the family. 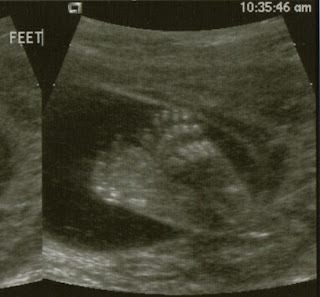 I had a mild panic attack on Thursday, when for some reason it hit me that OMG, I’m really having a baby. What am I thinking? Rob said it’s a little late for that. And yes, I really am having a baby. In less than five months. I went to my second ultrasound Friday. And I drank juice and ate some cookies, and really sugared up the kid. It worked. He was kicking and moving like crazy. And twisting and turning, and it’s still a boy. We saw his spine (one of the missing pieces) but he would. not. show. his. face. Every time he would roll, he would turn his face away. After lots of poking and urging and changing position, and he still wouldn’t move…I laid on my side for a few minutes. And then some more poking and prodding, he turned his head! Hooray! And promptly covered his face with his hands. Is this stubbornness a sign of things to come? Oh, boy. He did move his hands though, and we got to see his pudgy face. Everything looks great. Without further ado. Introducing Simon Kenton Powers. 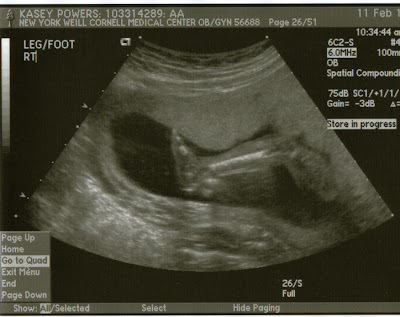 Coming July 2011. Connie is going to be a Grandma! Hahahah. And congratulations Kasey! He reminds me of Jay all ready. 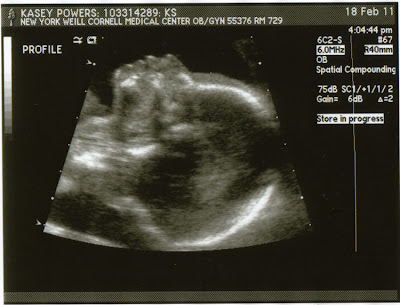 I used to sugar Jay up for ultrasounds too, that way I wouldn't have to come back. I had these things called stress tests and it was to see if the baby was moving and so sugar did the trick! 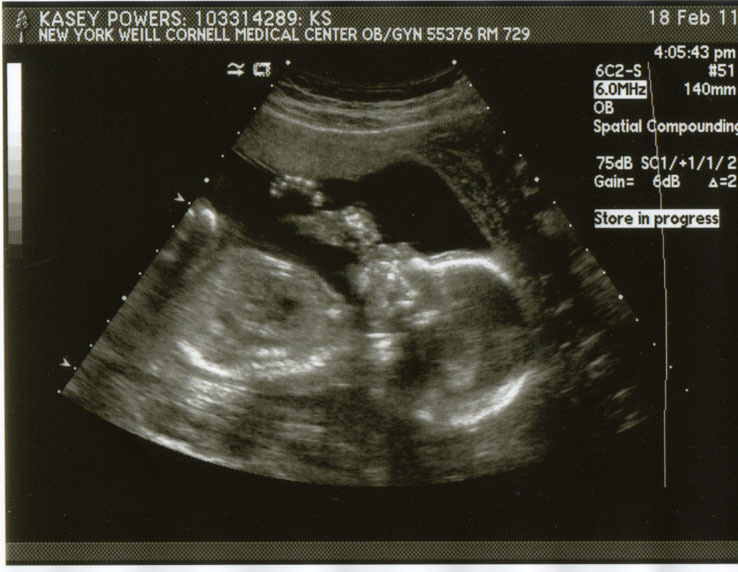 I love the ultrasound pictures! He is absolutely beautiful! It's an amazing and humbling experience to see a miracle right before your very eyes…God at work perfectly knitting together your little boy. Aww…makes my heart melt. 🙂 I love the name choice…sounds like a wise and strong man! oh. my. goodness. way excited about simon kenton! such a strong name. where did they come from (books, family, etc.)? can't wait to see more pictures of your bump! and we will plan a trip to see you at some point after the little man is welcomed into the world. yay yay yay!